Kristen Schaal is going to headline on Wednesday. So this Topsham Pantsuit episode will be as unmissable as you want it to be. Thank you, Ms. Schaal, and see the rest of you Wednesday at 8 pm. So John Oliver had to reschedule, unfortunately, and will not be performing this Wednesday, April 1. But we still have an excellent lineup, and will find a good replacement for Mr. Oliver. We'll let you know when we have a new John Oliver Pantsuit date. Avery Maharaja (Boulder, CO; $7/12 oz). We enjoy Avery’s description of this beer so much that we’ll just go with it: “This imperial IPA is regal, intense, and mighty. With hops and malts as his servants, [the Maharaja] rules both with a heavy hand. The Maharaja flaunts his authority over a deranged amount of hops: tangy, vibrant, and pungent, along with an insane amount of malted barley.” 9.8% ABV. Ithaca Ten (Ithaca, NY; $7/12 oz). This American extra strong ale starts off with some sweet, amber, fruity malts, backed up by ample bright, citrusy hops. The incredible balance in this huge brew makes it extremely smooth and drinkable. 10.0% ABV. Comedy night April Fool's Day. Details are below. I have a feeling that the distinguished Mr. Oliver will bring in a big crowd, so my usual recommendation to come super-early goes triple for this one. It's very likely that later comers won't be able to fit into the back room. Join us at Pacific Standard in Park Slope for Topsham Pantsuit: a pleasant evening of comedy, bookcases, exotic beers, and deceased "mayhem artist" Eat-'em-up Jack McManus. Pacific Standard is now on Twitter. Chin Music Thursday, March 26th at 7 pm. MISUNDERSTANDING OF NATURE (1994), both published by Graywolf Press. Her poems have appeared in publications such as The Atlantic Monthly, Boston Review, The Paris Review, Poetry, Fence, APR, Bomb, and The New Republic. She lives in New York City and Connecticut. Firestone Walker Union Jack IPA now available in bottles. "The newest member of the Firestone family, Union Jack is the aggressive IPA that you’ve been searching for. Citrus, pineapple, and a full chewy malt profile finish clean on your palate. Over 70 IBUs and 7.5% alcohol by volume, Union Jack won’t have any problem competing with the big India Pale Ales. A beer true to its origins; deeply hopped and bolstered for a long voyage." We're charging $14 for a big 22-ounce bottle, which is plenty for two (or more) people. We only got a case, so as usual you should do your best to come by soon and taste some Paso Robles goodness. Yes, sports fans, we will be opening early, at noon, on Thursday to show the NCAA tournament games, which start at 12:15ish on Thursday and Friday (and we'll be open at noon on Friday, as usual). Our beloved California Golden Bears will be taking on Maryland at 3 pm on Thursday, in an attempt to get some revenge for the indignity suffered by our football team, and of course we'll have that on. So play hooky from work and come by for a lovely afternoon and evening of basketball and pitcher specials. Pacific Standard's NCAA Tournament Augury-Off. "John," you say to me, whilst imbibing one of our fine consumables on a pleasant evening at the Standard, "John, my augury skills are beyond compare. I dare say I would challenge any other gentleman or gentlewoman in Brooklyn to an augury-off. If only there were a complex, thrilling foofaraw of a sporting nature that could serve as a proof of my augury abilities as compared to the rest of mankind." Well. Beginning on Thursday, and lasting until April 6, such a felicitous foofaraw shall occur, namely the 2009 NCAA Men's Basketball Tournament. Come by any time before Thursday, and fill out one or many brackets to enter our bar's competition. We want to be clear that this is by no means a cash tournament pool. But if it were, we'd ask you to give us a $5 entry fee per bracket for a chance to win the pot. The first place bracket would get all the money in the pot, and the second and third place brackets would get a couple drinks for free on Pacific Standard. Hypothetically, of course. Don't you just love thought experiments? The rules: we give you points for each correct pick based on the seed of the team you picked. To wit, if you correctly pick a 1 seed to win a game, you get 1 point. If you correctly pick a 16 seed to win a game, you get 16 points. You also get a multiplier based on the round: picking a team to win correctly in the second round gives you double points, the third round triple points, the fourth four times your points, the fifth five times, and the championship game six times. It sounds more complicated than it is. Suffice it to say it's a system that rewards getting your picks right, as well as picking upsets. Cool? Get your picks in before Thursday, and enjoy the tournament here starting Thursday with our full March Madness satellite TV package on our two big projection screens, and pitcher specials. Anchor Our Barrel Ale tasting March 24. --Anchor Our Barrel Ale, a carefully considered blend of Anchor ales, aged in-house in ex-Old Potrero handmade oak barrels. --Anchor Gins (Junipero Dry Gin and Genevieve Holland-Style Gin). Arrive here early to ensure you'll get to taste everything! Kelso Recessionator now on tap. Kelso Recessionator (Brooklyn, NY; $7/12 oz). This Double Bock, a limited one-batch release from Kelso, is a very complex brew, with hints of dried fruit, alcohol, and even some coffee. This might be the only batch that ever gets made, so get it while you can. 8.2% ABV. just went on, and should last through this weekend. Emphasis on the "should." Get your hop injections early and often this week, because it might all be gone by Friday night. 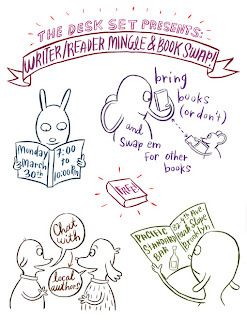 Desk Set book swap on March 30. We'll have all the Pac-10 men's basketball tournament games here at Pacific Standard, including the Cal-USC first-round game Thursday at 9 pm. Come by to watch your favorite West Coast team! Troegs Nugget Nectar back on tap, finally. For those of you who have popped in every once in a while with feverish visages and glazed eyes, asking for the heavenly concoction known as Troegs Nugget Nectar, we have managed, through fiendish machinations, and at the cost of the lives of many good men, to get at least one keg in stock. Hopefully more will follow, but if we were you, we'd get down here and drink as much of this keg as possible, while it lasts. New comedy lineup for tomorrow. Goodbye, Aaron, and best of luck in Baltimore! We'll miss you. Tuesday, April 21st, 7:00 p.m.
Nathaniel Rich's first novel, THE MAYOR'S TONGUE (Riverhead), earned him praise on both sides of the Atlantic, with Stephen King calling it "an elegantly structured, brilliantly told novel, by turns terrifying, touching, and wildly funny, and always generous and magical." Rich, an editor at The Paris Review, is also the author of SAN FRANCISCO NOIR. His writing has appeared in The New York Times, The New Republic, and The New York Review of Books. Ed Park's first novel, PERSONAL DAYS (Random House), was named one of the top 10 works of fiction of 2008 by Time Magazine, was a finalist for the John Sargent Sr. First Novel Prize, and was recently named a finalist for the PEN/Hemingway Award. At least one reviewer declared it "funnier than [Agatha] Christie." A founding editor of The Believer, Park has also written copiously for The Village Voice, The Los Angeles Times, and other publications. Philanthropic activities controlled by dartboard! Christine Schutt, Paul La Farge, and Garth Risk Hallberg are 2008 Artists' Fellowship recipients of the New York Foundation for the Arts (NYFA). This program is co-sponsored by Artists & Audiences Exchange, a public program of NYFA. It is free and open to the public. We suggest a donation of one gently used book to benefit the Housing Works Used Book Cafe. CHRISTINE SCHUTT's most recent novel, ALL SOULS, is "exciting evidence that she continues to push the boundaries of fiction," according to The New York Times Book Review. Schutt's previous novel, FLORIDA, was a finalist for the 2004 National Book Award. She is also the author of two short-story collections, A NIGHT, A DAY, ANOTHER NIGHT, SUMMER, and NIGHTWORK, chosen by John Ashbery as the best book of 1996 for the Times Literary Supplement. PAUL LA FARGE is the author of the novels THE ARTIST OF THE MISSING and HAUSSMANN, OR THE DISTINCTION, a New York Times Notable Book which won him praise from the San Francisco Chronicle as "a magician on the order of Prospero." His most recent book is THE FACTS OF WINTER. LaFarge has been honored with a Guggenheim Fellowship and the Bard Fiction Prize. His stories and essays have appeared in McSweeney's, Bookforum, and Conjunctions, among others. Garth Risk Hallberg is the author of A FIELD GUIDE TO THE NORTH AMERICAN FAMILY. His fiction has earned nominations for the Believer book award and the Pushcart Prize, and has been included in the anthology Best New American Voices 2008. He contributes to the literary blog The Millions, and on most Pacific Standard fiction nights, plays the role of "host."